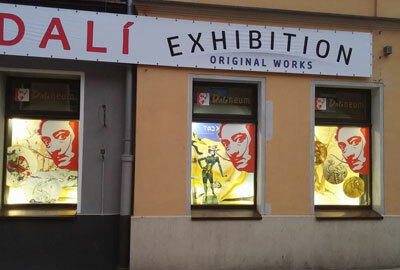 First time in Poland, original works of Henri de Toulouse-Lautrec are now in Poznan, in Dalineum - Centrum Salvadora Dali, exhibition is realized in partnership with Collection Kesauri. Exhibition is open 01/01/2018 to 15/03/2018 and is featuring 47 exhibits consisting of original works of one of greatest Masters of the Belle Époque - Henri de Toulouse-Lautrec. The exhibition "Different facets of the Belle Époque" is showing how Toulouse-Lautrec illustrates the Belle Époque : splendid works on two series - one on thematic is illustrations for "Au pied du Sinai" of Georges Clemenceau, where are presented Jews, other representing illustrations for the popular ballads of Desire Dihau... This he did in an insightful way, capturing the essence of characters and places. Toulouse-Lautrec’s subject matter was to become thoroughly modern and he became an influential figure in the evolution of the art of the twentieth century. Also this work on "Au pied du Sinaï" can be viewed as Lautrec’s only foray into the political arena of his time. Curated by Kesauri Aleksandre, Kessaouri Vassili, produced and organized by Art Expo S.I.A. in partnership with the Collection Kesauri. 1. Portfolio "Au pied du Sinaï" (1898). 2. Portfolio "Quatorze Lithographies Originales de Toulouse-Lautrec pour Illustrer des Chansons" (1895) (2e etat). 3. Yvette Guilbert - Toulouse-Lautrec's favorite model and superstar of his time. 4. Other works of Toulouse-Lautrec. Section one introduces visitors to one of Henri de Toulouse-Lautrec's greatest artistic passion: engraving, or lithography to be more precise. An exceptional series of works, the only exemplar printed especially for the Paris art critic Arsène Alexandre (1859–1937), friend of Henri de Toulouse-Lautrec and of writer of "Au pied du Sinaï" - Georges Clemenceau. Realized on Arches Paper with watermark "Arches France", with an additional suite printed in various tones on Chinese paper and with use of Japan paper for the cover. The complete set of original lithographs “Quatorze Lithographies Originales de Toulouse-Lautrec pour Illustrer des Chansons” that represent definitive version of illustrations of French Melodies composed by Desire Dihau for lyrics by Jean Richepin. Lithographs was created from the original lithographic stones engraved by Toulouse-Lautrec for Éditions Joubert in 1895 and are hand numbered, on Arches wove paper with watermark "Arches France". Sections devoted to Toulouse-Lautrec's favorite model and superstar of his time - Yvette Guilbert. With original lithographs by Toulouse-Lautrec and items related to the popularity of Yvette Guilbert. Some works of Henri de Toulouse-Lautrec that are outside of a series.